Among the greatest fears sparked by the ongoing conflict in Syria is that the country will soon be irreconcilably divided, with sectarian groups implacably pitted against one another in an open civil war. Indeed, there’s no doubting that the Syrian population comprises various ethnic and religious groups, each with its own grievances. But at a rally attended by hundreds of Syrian immigrants last Saturday, I heard a very different message about the Syrian-American community. 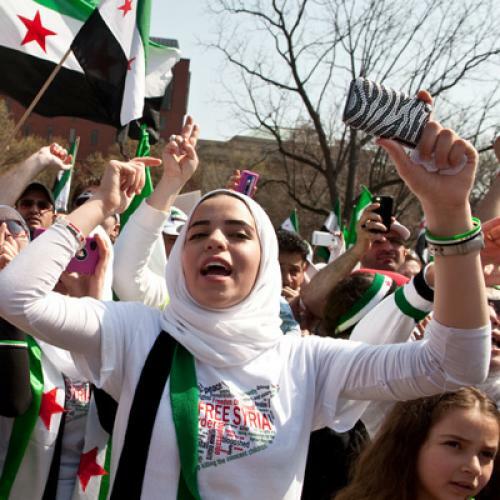 The “United for a Free Syria” protest in Lafayette Park, located directly in front of the White House, drew Syrian-Americans who live all across the United States—and who have roots all across Syria. The people I spoke with there were a diverse group: old, young, male, female, and hailing from a variety of sectarian backgrounds. They had come out to show their support for the revolution that started a year ago this week, and to pressure the U.S. government to help in their cause. Those from younger generations, like teenage Nora Basha who was born and raised in America, have made strong connections with other young Syrian-Americans through social media. Nora met one of her close online friends for the first time at the rally. She told me that since the revolution she “had never felt more of a bond with the Syrians in the community,” especially those from Idlib, where her family is from. This concern for family and friends in Syria is perhaps one of the driving forces behind the increased sense of community, as those unable to contact loved ones in embattled cities have at least been able to share this experience with other Syrian-Americans, regardless of sect. It was reflected in the mood of the rally, which seemed as focused on celebrating the protesters’ communion as it was on decrying the atrocities being carried out in their homeland against people many of them know personally. That’s not to say that Syrian-Americans have refused to reckon with just how dire the situation within Syria has become. The vast array of signs in homage to family and friends lost in the conflict attested to that. And some attendees noted that the Syrian community’s admirable cohesion in the United States may not translate so easily overseas. A man who asked to be called “Sammy,” out of fear that relatives in Damascus would be targeted if his real name was published, told of how his Christian family in Syria had “a lot of mixed feelings” over the revolution, as they had been reliant on the protection of the Assad regime for years and feared persecution.